This is a documentary about Herbie and Dorothy Vogel, a little couple of modest means but a focused passion who assembled a world-class art collection buying small, affordable works but choosing wisely and with love and living for art. They married in 1960, Herb quickly communicating his love of art to Dorothy. They began by studying painting but quickly shifted to collecting from the ideal vantage point of New York City. He was a postal worker, sorting mail at night, and she was a librarian in Brooklyn Heights. They used his salary for the purchases and hers for the rent of their small one-bedroom rent-controlled apartment and other living expenses. He had the expertise, but she caught on; and they were (and are) inseparable, a team. Both were open-minded and excited by what they found. They focused on minimal, conceptual, and verbal art because that was what they could afford. Abstract expressionism was fading and Pop Art was the big new thing. They were "greedy," someone says (a Who's Who of artists appear onscreen to talk abut the couple, who were famous in the New York art world by 1970). "You like to buy four at a time," an artist says. "No, forty," jokes Herbie. They were single-minded, and their apartment filled up. They have cats and tropical fish and turtles but never had children. After Dorothy got off work and before he went to his they got together and went to galleries, or visited artists, from whom they bought directly. Some galleries don't like this and, if they pay an artist a stipend, claim exclusive rights. But that is a thing of the Fifties and rare today. Most of the artists they bought from were unknown then and desperately needed money. The Vogels had the same dedication and indifference to necessary poverty the artists had. And theirs has been a life in art as rich as any artist's. When they finally called Christo and Jeanne-Claude, she picked up the phone and said "It's the Vogels! We're going to pay the rent this month." But when they came and heard the prices of sketches of the coming Christo project, Valley Curtain, Herb said, "Oh, we came too late!" They were several thousand dollars, amounts used to fund the couple's costly environmental artworks. But they became friends and when Christo and Jeanne-Claude went to Colorado to finish Valley Curtain, they gave the Vogels a drawing in exchange for taking care of their cat, Gladys, while they were away. The Vogels collected work by, among others, Chuck Close, Pat Steir, Lida Benglis, Robert Mangold, Sol Lewitt, Donald Judd, Carl Andre, Richard Long, Julian Schnabel, Jeff Koons, and Richard Tuttle. All these artists' work eventually have come to be worth megabucks, but the Vogels would sooner have amputated a limb than sell anything they'd bought. Speculating is fine, and may help the artists, Herb says, but it was not for them. Not all the artists they collected have become famous, but they have loved everything they got. Their first Lewitt was tall, and they traded it for a horizontal one; he must have delivered both, because they liked to buy smaller works that they could take with them in a taxi. And they kept everything somewhere in the apartment. Filmmaker Sasaki has done an excellent job of assembling voices. Sylvia Mangold, Chuck Close Lynda Benglis, Pat Steir, Robert Barry, Lucio Pozzi and Lawrence Weiner are some of the main artists who talk about the Vogels' passion and skill and friendship. There are also museum curators. The film makes clear the Vogels are famous collectors, chronicled and celebrated in many articles (books will surely come). It may take some time for this to sink in. This cute little old couple -- they are old now, the long necked, erect woman with her big round glasses, the little man hunched forward, focusing on an art work he wants like a beagle pointing a bird, unswerving, obsessed. They're sweet, but they're relentless, a life force. Chuck Close calls them "the mascots of the New York art world." Surprisingly, there is plenty of period footage of them from earlier decades, gallery-going, being interviewed, being greeted at openings by artists or gallery owners as honored guests. At the post office Herbie revisits (he retired in 1980) we learn he kept his fame and passion secret and found nobody who wanted to talk about art there anyway. Many museums sought the collection and the couple always said no. When they didn't say no to the National Gallery in Washington (which they had visited on their honeymoon) curators came calling in 1992 and they agreed to donate. Only to consider this offer, the National Gallery had to catalogue the collection's over 2000 pieces, and this was impossible in the limited space, so the art works had to be crated piece by piece and shipped to Washington for evaluation. It too five giant moving vans to transport the collection from the little one-bedroom apartment. It was packed so tight. The National's rule (a reason for the Vogels' confidence) is that donations it accepts can never be deaccessioned; hence eventually the museum decided it could only accept half the works. So a program has been set up to travel the other works around the fifty states. This is called the Vogel 50x50 program. The film also shows Herbie and Dorothy together in many scenes that convey a sense of their oneness, keen memory, precise knowledge, and love of the works they've collected. You see Herb doing his beagle thing, zeroing in on a small early John Chamberlain piece and explaining why it's every bit as representative and good as a larger Chamberlain and how unusual that is. The donation cleared room in the jammed apartment so the Vogels could move around a bit, and as the curator thought, acquire a little more furniture. The museum pays them an annuity to keep them financially secure. But instead of using that to buy, say, a sofa or a chair, they put it and their pensions into filling up the apartment with art again and by 2008 they'd collected 4,000 works in toto. We do see Dorothy buying a Mac laptop in the closing credits, though, so she can email with a real computer. In a way Herb and Dorothy are like Christo and Jeanne-Claude (another inseparable team). The finances have certainly been different, but both are couples who have lived spartanly and basically put every available penny into art. 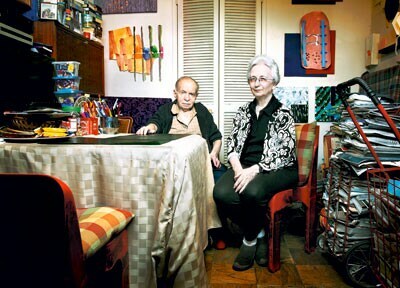 There is much to inspire artists and collectors in these two extraordinary and dedicated couples.